P ick-up bands make great trim for wool bags or pouches. I’ve designed these so that the trim extends in a loop at the top on each side, forming an easy and elegant closure and handle at the same time. 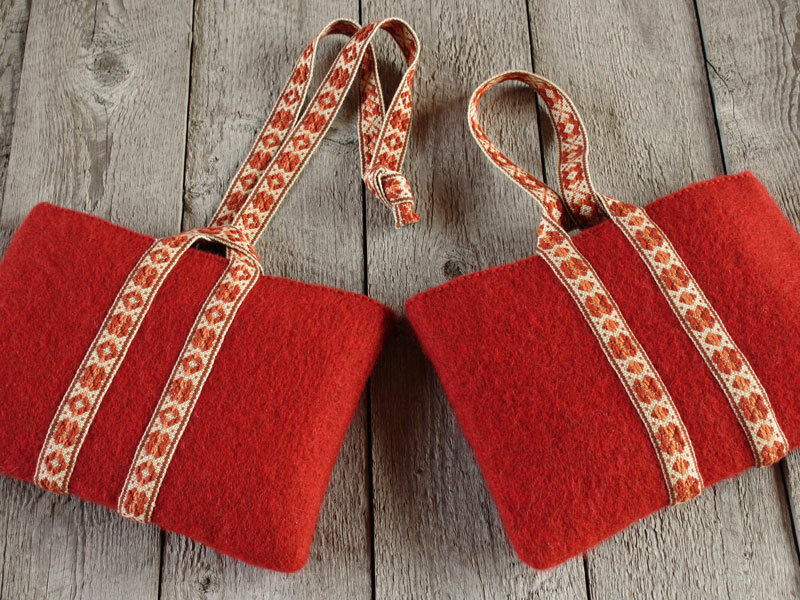 The pouches themselves are knitted-and-fulled (felted). The size (about 10″ wide and 7″ high) is just right for a cute little purse or a tool pouch to hold a band heddle and shuttle. 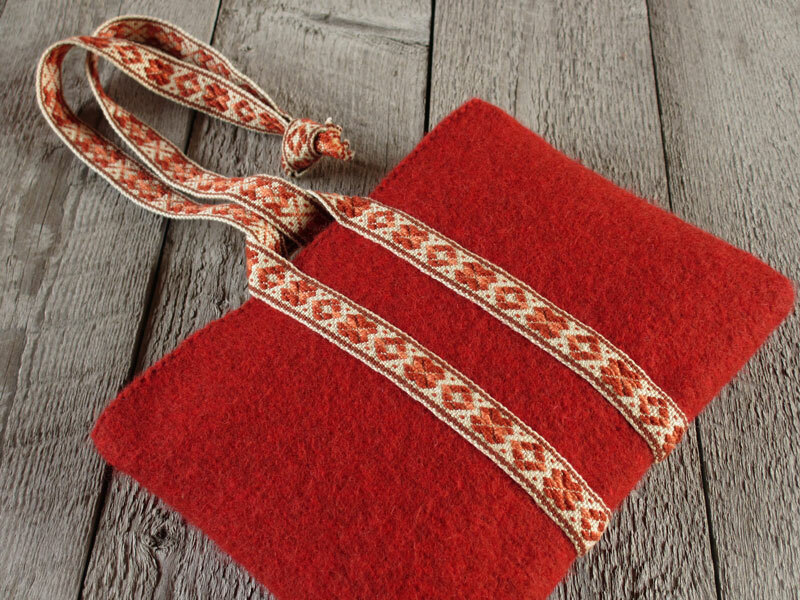 One pouch has a shoulder-length handle with a simple knotted finish (this one is also pictured on page 103 of the book). The other pouch has a wristlet-length handle with no knot. I’d like to share the details of my designs with you. 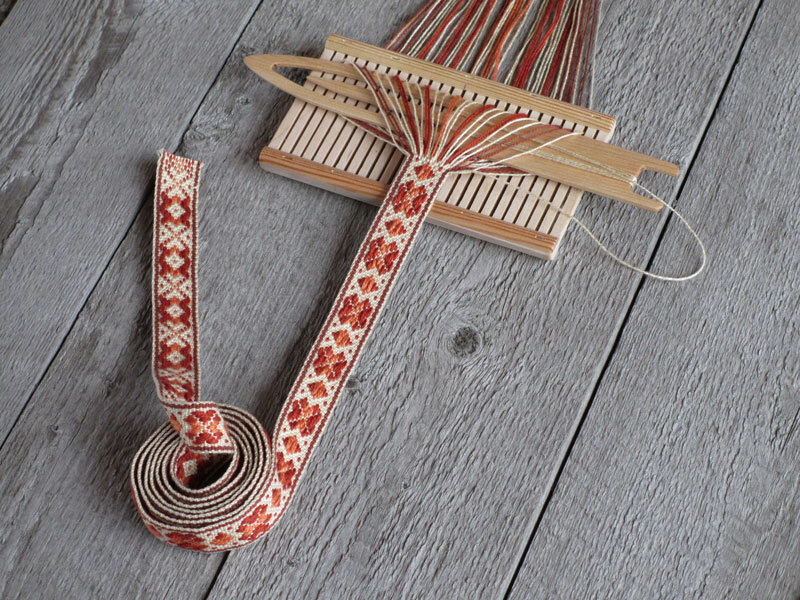 Equipment: Inkle loom or band heddle to accommodate 45 ends (if you prefer the “finger method” of making pick-ups and push-downs), or pattern heddle to accommodate 9 pattern ends and 10 border ends on each side (if you prefer making pattern end selections with the pointed shuttle). Warp yarn: Perle cotton 5/2 in four colors, background (I used UKI color Flaxon), main pattern (I used Silk City color Paprika, since discontinued), accent pattern (I used UKI color Melon) and border (I used Silk City color Tobacco). Picks per inch: About 13-14 measured at slack tension. Weaving: See pattern charts below. Stitching for the short handle: Straight stitch with the sewing machine across the ends of the band in the valley between two weft rows, then fold under ½″ at each end and press the folds hard with a steam iron. (I positioned the folds so when the two ends were butted the pattern would match.) Pin the band to the pouch, centering and looping as shown in the photos–you want a short loop on one side for the closure and a longer loop on the other side for the handle. (I left about 1¼″ between the two strips and extended the handle about 7″ from the top of the pouch. I positioned the trim so the join in the band, where the two folded ends were butted together, was near the bottom on one side, as shown in the photo at right.) With sewing thread, whipstitch all selvedges of the band to the pouch, then mattress stitch across the join. Follow the guidelines for the wristlet-length handle with these changes: Determine the finished length you need for your band, including plenty of length for tying the overhand knot in the end. Plan your warp length accordingly, taking into account take-up and shrinkage as well as warp waste. (My handle extends 16″ from the top of the pouch after knotting. My band was 73½″ after wet finishing.) Trim the band by cutting in the valley between two weft rows, carefully pulling out the last row of weft and clipping it off. You could tuck that weft end into the row above with a small tapestry needle, but when the band isn’t fringed that action can loosen the fabric so I leave it alone. With much wear and washing a row or two of weft might ravel out and need to be clipped but a firmly-woven warp-faced band is very stable. Tie an overhand knot in the ends of the band and pin to the pouch as shown–you want a small loop on one side for the closure and a long loop on the other side for the handle. With sewing thread, whipstitch all selvedges of the band to the pouch. 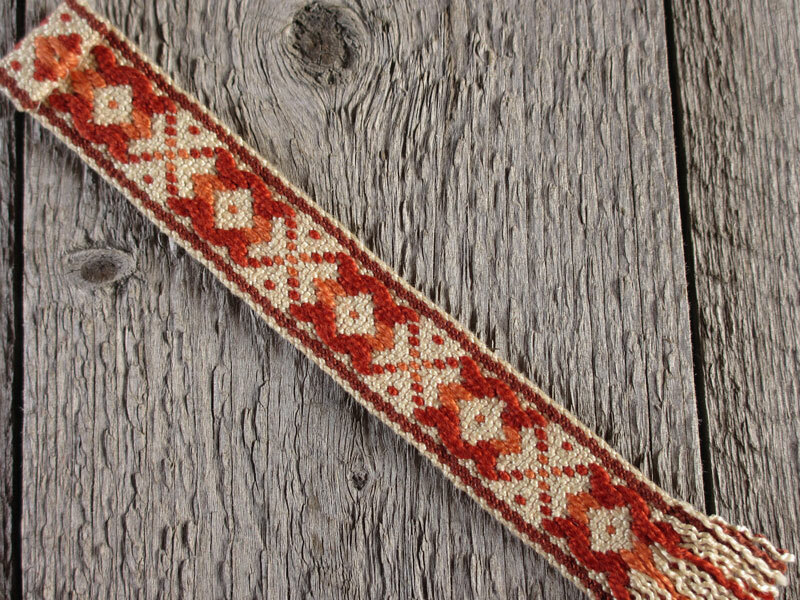 For the bands for both of my pouches I used a rosette (a common motif in Norwegian pick-up bandweaving) alternating with a small diamond shape (a different diamond shape for each pouch). My patterns charts are shown below. In the book I introduced my system, helpful for beginning pick-up weavers, of marking a pattern chart with caret symbols (for pick-ups) and Xs (for push-downs), explained on pages 128-29 of the book. But experienced pick-up weavers don’t need the symbols—they have a visual understanding of the motif as a whole and can quickly glance at the fell line to see which ends need to be manipulated on each row. 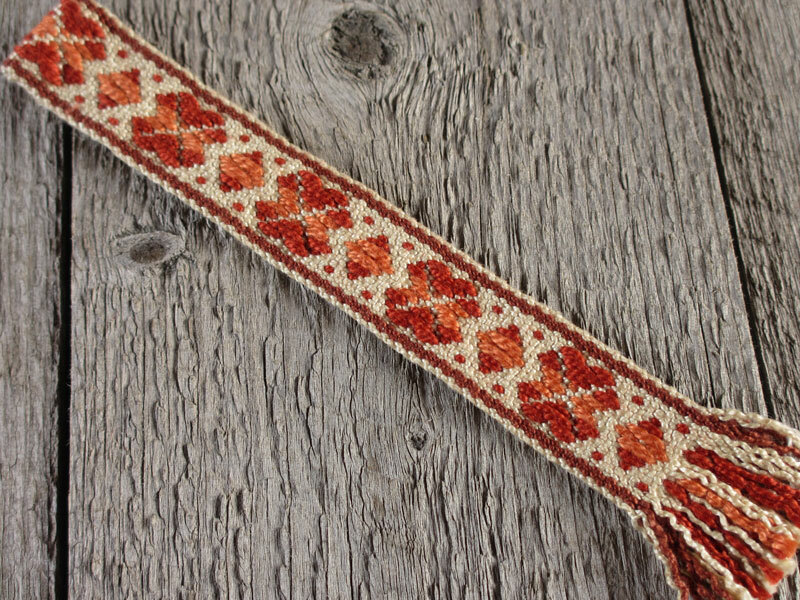 And weavers who are using the pattern heddle also don’t need the symbols whether they are experienced or not, since the pattern heddle operates on a different system and such symbols would be a distraction. Therefore, I’ve given two charts for each pattern, one with the symbols and one without, so you can use whichever you prefer. The pouches have padding inside to round them out for the photos, and without anything inside they lie completely flat. 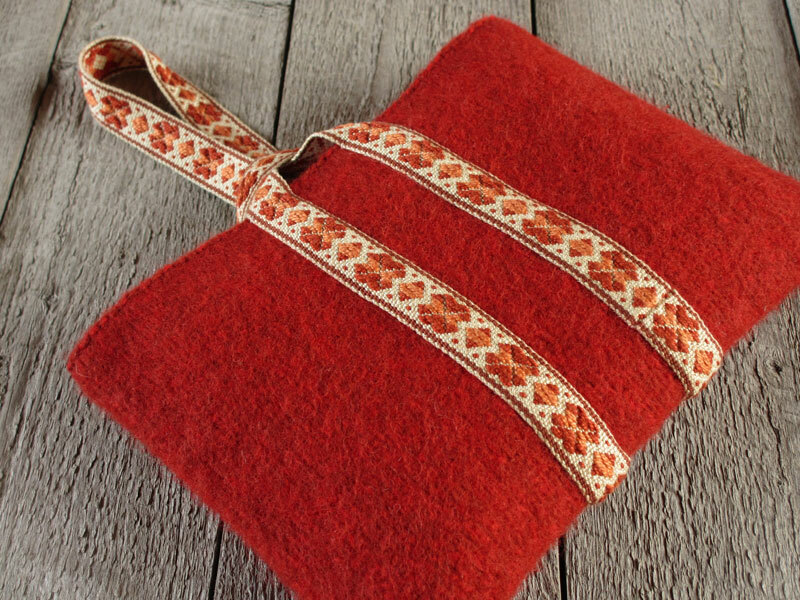 I’ll tell you how I created my pouches, but you will likely have your own preferred methods of knitting and fulling (felting) and can design your own accordingly. Yarn: I used Rauma Vamsegarn, 100% wool, 3-ply bulky knitting yarn, 80 meters per 50 gram ball, in Red/Rust Twist (color since discontinued). One pouch weighs about 92 grams. For waste yarn I used worsted-weight cotton (non-fulling) yarn at the start and finish so I could later create the crisp finish along the top edges as described below. Gauge swatch: Before knitting the pouches shown, I made a half-scale model (25 sts and 60 rs) to use as a “gauge swatch” (it is pictured on page 103 of the book with a very narrow pick-up band for a handle). It was exactly half the size I wanted so I doubled the stitch and row counts for the pouches. Knitting: I used a bulky-gauge knitting machine (Toyota KS610, stitch size 5.0, 50 sts and 120 rs). See diagram above. Dimensions after knitting: 12¾″ wide and 21½″ high. Seaming: I folded the flat piece in half, wrong sides together, and seamed the sides by loosely whipstitching with project yarn, catching only the outside loop of the edge stitch on each side. 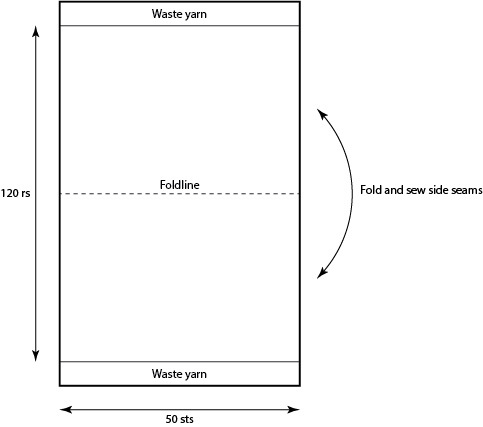 Dimensions after seaming: 12¾″ wide and 10¾″ high. Fulling: I hand-fulled one pouch in the kitchen sink, the other in a front-loader washing machine. Finished dimensions after fulling: About 10″ wide and 7″ high. How to get the crisp, clean edge along the top: After fulling, cut away the waste yarn. Even though the cotton waste yarn does not full, it is tightly held by the fulled stitches and requires much clipping and pulling to get it out. With the waste yarn removed, hold the edge up to the light to see the open stitches. Using project yarn and a blunt tapestry needle, backstitch through the open stitches, from left to right on the wrong side of the pouch. I wove one band a little longer than I thought I’d need, to give myself some leeway in deciding how long I wanted the handle when it came time for assembly. I ended up with a short leftover piece, so I used it to make a little bookmark. I double-folded a narrow hem at the top and whipstitched it in place. Then I carefully pulled out some of the weft rows at the other end, with the help of the blunt tip of a small tapestry needle, to make fringe. I secured the weft by carrying the end extending from the last row into the row just above it with a small tapestry needle. Because I’d already washed and steamed the band, the bookmark is sporting definite ringlets, which I think add to its charm. The back is shown at right. Thanks for this generous post, Heather. My copy of your book arrived last week and I’ve hardly put it down since. It is excellent on all counts: information, instruction, examples. It’s also beautifully done. Kudos to you and your publisher. Thank you for your kind words, and I’m happy to hear you are enjoying the book so much!